I wrote a book! — . It’s official: I am a published author. 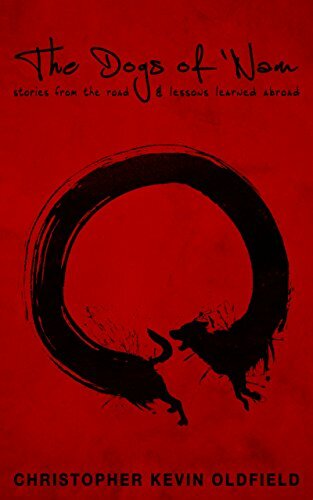 The Dogs of Nam, in case you aren’t aware, is my collection of short stories based on the past +10 years of my travels. Part clueless comedy, part poetic reflection, it’s an honest look at what life on the road is like as a budget traveler. This is what travel looks like beyond the shallow #wanderlust and #yolo scenes you’ll find on social media – the ups, the downs, and the awkward in-betweens. And it's now available on Amazon! For those of you lovely folks who have had the opportunity to travel, this book (I hope) will serve up a hearty dose of nostalgia. You’ll be able to relate to the feelings and experiences, and I hope it brings back fond memories of your own trials and tribulations on the road. For those of you who haven’t yet travelled, this book will serve as a wakeup call. Life’s too short to keep putting your travel dreams on hold, and this book will give you that final prod to get out the door and into some adventure. Travel is a uniquely personal, yet entirely relatable, act. I’d like to think The Dogs of Nam captures the essence of that act — as much as it can be captured, anyway. But don’t take my word for it. Give it a read and let me know what you think! Friends, this has been a heck of an adventure. Thanks for your support. I hope you all get a chance to get out there and experience some of the beautiful, scary, hectic, and wonderful thing I've seen on the road. You’re all lovely, and I look forward to hearing what you think! For exclusive updates and behind-the-scenes ramblings, sign the heck up! We respect your privacy and will never share your deets with anyone!